Black Friday sales have been starting earlier and earlier every year, and in recent years, a few brave retailers have broken the midnight threshold to open their doors late in the evening on Thanksgiving. On Thursday morning, Walmart (WMT) threw down a new gauntlet: It announced it would open its doors at 8 p.m. Thanksgiving evening. That's the earliest the nation's biggest retailer has ever opened for Black Friday. So far, Walmart is only being matched this year by Sears (SHLD), which also announced an 8 p.m. Thursday opening in its circular. However, some other major chains have yet to announce their Black Friday plans, so we wouldn't be surprised to see some of Walmart's other competitors announce similar hours in the name of keeping up with the Waltons. The 8 p.m. opening is probably not so early that it will interfere with anyone's traditional Thanksgiving dinner, but early enough to preempt another Thanksgiving custom: Watching football. While the day's earlier games in Detroit and Dallas won't lose viewers to the sales, the traditional post-dinner evening game -- this year, a matchup between the New England Patriots and New York Jets -- kicks off at 8:30 p.m. And that means, in some households, gathering around the TV in a post-turkey daze will be replaced by lining up at the local Walmart to grab the best deals. And there are certainly some terrific deals to be had for those willing to skip the game, or whatever other activity you used to enjoy in your tryptophan haze. Walmart's announcement mentions a number of doorbuster deals, including an LG Blu-ray player for $38, an Emerson 32-inch TV for $148 and an Apple iPad 2 plus a $75 Walmart gift card for $399. While doorbusters are usually limited in quantity, Walmart says that for those three products in particular, it can guarantee supplies will last for all shoppers in the store or in line between 10 p.m. and 11 p.m. Other deals include the Nintendo Wii for $89 (not to be confused the next-generation Wii U, arriving Nov. 18) and a six-quart Crock Pot for under $10. In the Black Friday circular posted to its site, Sears features a 32-inch TV for just $97 and 50% off cases for the Nook Simple Touch for Thanksgiving night shoppers. Those who show up on Friday -- starting as early as 4 a.m. -- can get a 9.99 Craftsman electric drill/screwdriver. 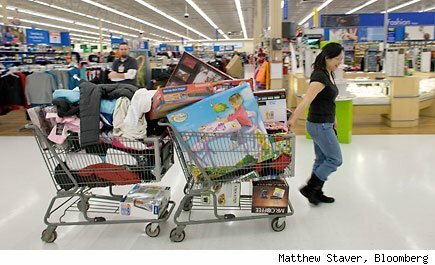 While the early start to shopping will rub some traditionalists the wrong way, it's worth noting that an 8 p.m. opening has at least one advantage over the midnight opening: It let's shoppers grab their deals and still get to bed at a reasonable hour. On the other hand, Walmart employees working that day will have less time to spend with their families on Thanksgiving. That's sure to further aggravate employees already threatening to walk off the job on Black Friday in protest of working conditions. Note: A previous version of this article indicated that the Sears' Black Friday was unconfirmed to this point. The article was updated at 3:22 p.m. to reflect the fact that the ad has been posted to Sears' official site.